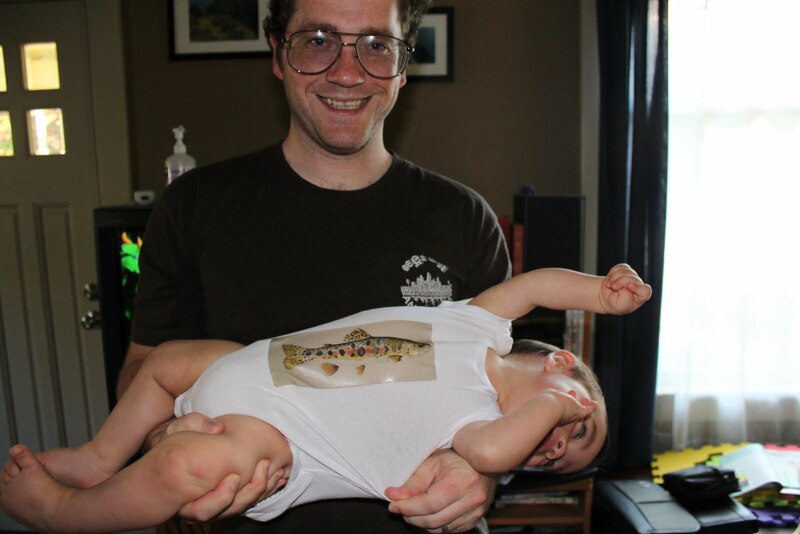 That's not a trout, that's a baby silly! The last several days the boys have been experimenting with letting go and balancing on their own two feet. Caleb does it the best then Eli and Thomas has done it only a few times. But I think Thomas has a plan, since he's Mr. Confidence, he's probably is just waiting it out a bit more. Caleb is really fun to watch because he'll stand up, let go and then giggle and laugh the whole time he's standing, it's like he's getting a rush doing it. 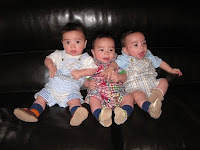 All the boys will take a step or two to the left or to the right while they are holding onto something (like the couch or their fence). They don't seem to really know what they are doing when I hold their hands and try to get them to walk forward. Sometimes they take a couple of steps and other times they just want to go back to crawling. So I'm not sure what this means but maybe they are getting close to walking soon...but I guess we'll see. I walked at 10 months and Phil walked at I believe 12 months so I'm interested to see when they'll actually start walking. 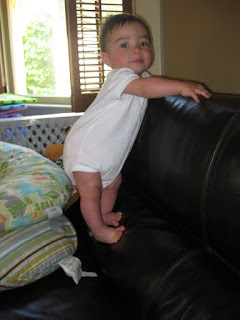 Caleb loves climbing things, once they can get themselves onto the couch I'm in trouble! We had a week of firsts, not for babies but for mom. 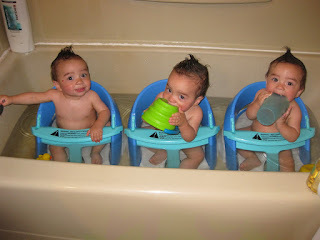 I had been mulling it over in my head and trying to come up with a plan to bathe the babies all on my own. 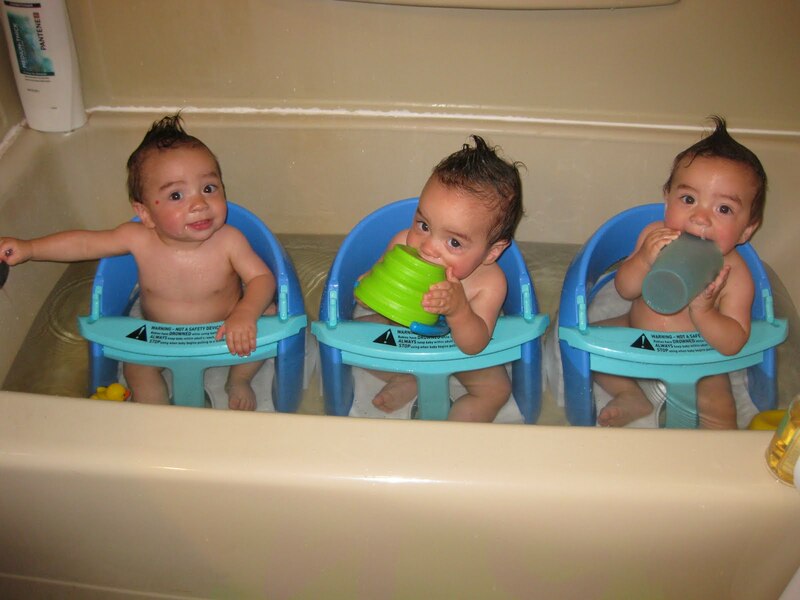 I'd done it before when we were still using the baby bathtub but now that they are using the bath seats it's a little bit trickier. I spent the first half of the morning juggling the babies and setting up the bathroom just so. I had to have everything I needed so as not to "feel" like I need to run out and get something during bath time (not that I'd ever leave them alone in the bathtub). 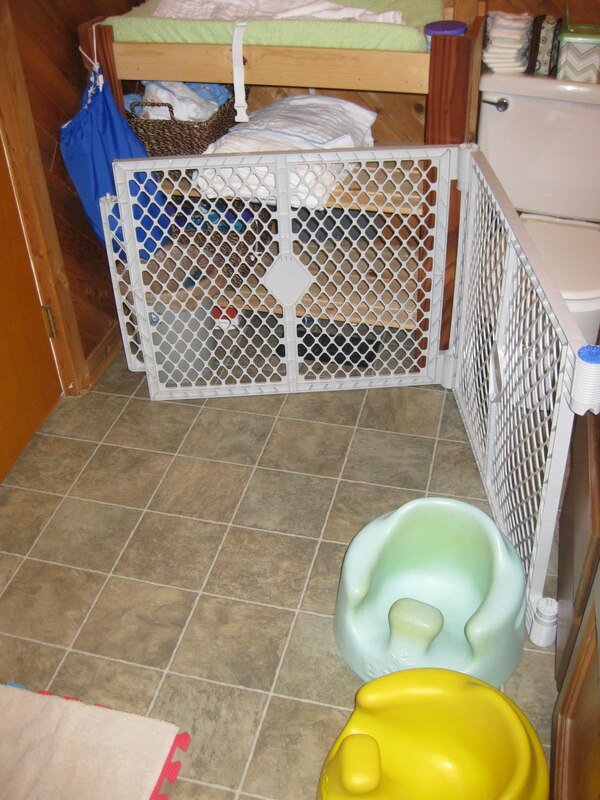 Also, I needed to be able to set the babies on the floor and not have them get into the toilet or trashcan. 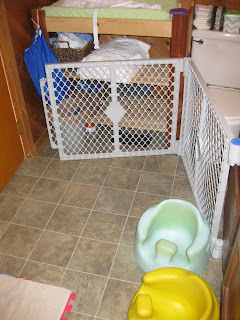 First I cleaned the bathroom (floors and tub) then brought in a panel of our baby fence to block the toilet. 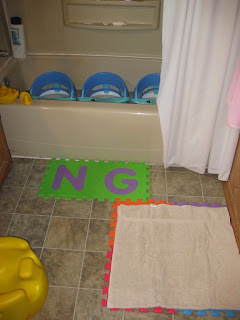 Next I set up the bath seats in the tub and filled it up with water. I dragged all the babies in and then we proceeded with bath time. It went very well, only I was completely exhausted when all was said and done. I can do this again but quite honestly I don't want to. The following week when we did bath time (two persons this time) and in a split second Caleb lunged out of his bath seat head first into the water, it scared the crap out of all those involved. That was the nail in the coffin, I don't ever want to go through that by myself so until the boys are a little easier to handle bath time is a two person operation. Since no shots were involved with this well child check up I figured I'd attempt it solo. My plan was to get to the clinic parking lot and nurse the boys in the car. They hate being in their car seats unless the car is moving so I had Phil take out the extra seat in the van so that the two that were not nursing at the moment could play on the van floor. It worked out great, only that all the parking spaces were taken so I had to park in a garage which made it really dark in the van. Oh well the babies didn't seem to mind. So it was the double stroller and I carried the third on a baby carrier. 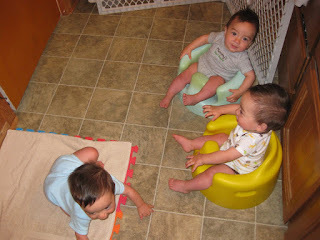 I brought a Bumbo along to help me juggle the babies, which worked out great but since they can easily jump out of them I had to keep a close eye on whoever was in it. Caleb at some point ended up on the ground but didn't seem phased by it. Next check up is at 1year and there will be 5 shots so I might try to bring two others! I have always avoided reading those "what you can expect" or "what your child should be doing" books for a couple of reasons. 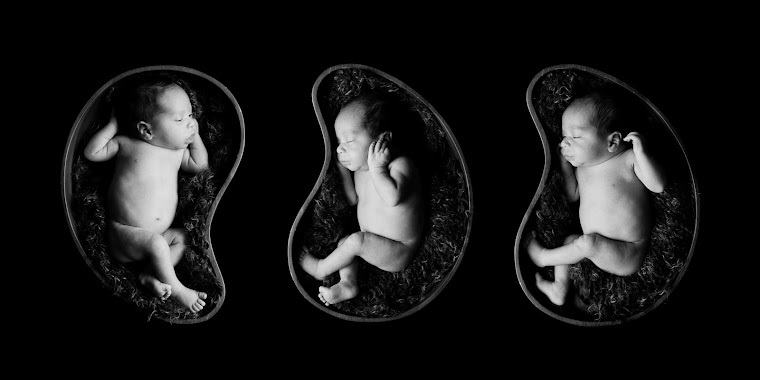 First, all babies develop differently and I don't want to be mentally tied down to what a book says and then if my baby isn't developing accordingly feel like there is something wrong when there isn't. 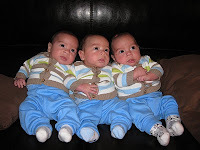 Second, since the triplets were born pre-term they are technically playing catchup to full term babies so let's just say I was a little self conscious. Their pediatrician reenforced what I already felt in my heart. Except for the very beginning these guys have developed as if they had been full term. 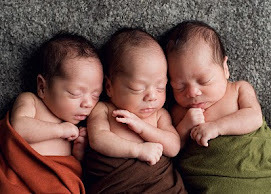 Being premature has affected them in the least. All their milestones have been within normalcy. So I'm doing away with their "adjusted age," forget that, we are beyond that and probably always have been! The boys are down to two naps a day instead of three now, it's very liberating because I have more time before babies get tired and cranky. This is why I've been more willing to try things on my own. No more swaddling, we had to phase it out, much too hot for that. We also just said goodbye to their last swing and the jumparoo (jumping chair), they are too big for them and were getting bored by them. 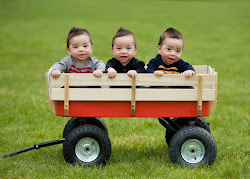 Also, about two weeks ago Caleb and Eli caught up to Thomas, they don't "drag" crawl like they used to. They all crawl on all fours and boy can they move fast! Bye-bye swing, we're big boys now! 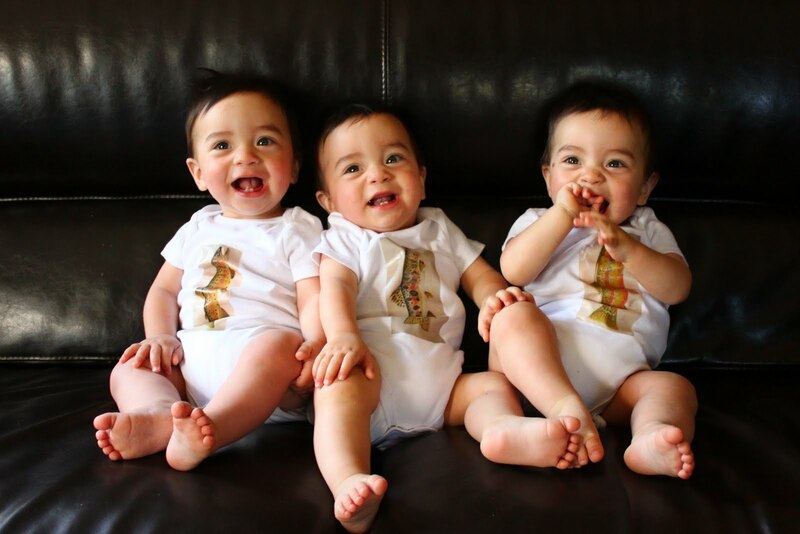 Camping + Triplets = Disaster? more camping pics at our flicker account, see right side bar under MORE PICTURES! We planned this trip months ago and I thought that by then we could surely handle going camping. Well as the day approached I was getting more and more nervous especially since the babies had never spent the night elsewhere. 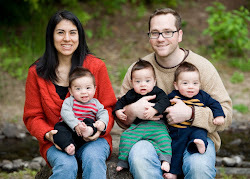 They actually did pretty good and while it wasn't super relaxing, which life with triplets never is anyways, it definitely wasn't a disaster. Brit and Phil did a little fishing here and there and would take one or two boys with them. 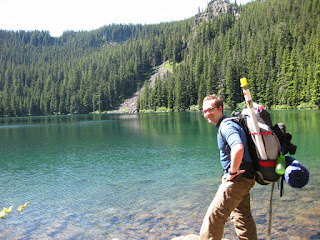 One day we did a big hike, and by big I mean about 3 miles round trip. Everyone carried babies except me and let me tell you it left me sore for at least two days. Jehan convinced me that I need to increase my core strength and taught me some moves to help with that...let's see if I can do them regularly enough to actually help. For the trip I brought along disposable diapers to simplify things. 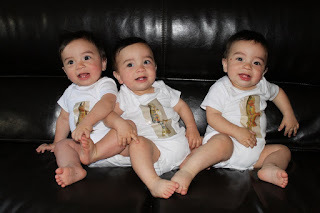 I think the experience has turned me into a self proclaimed cloth diaper advocate. 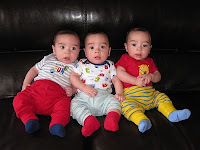 I think parents of multiples are afraid of the added work with cloth diapers but really I'd rather deal with them than having to deal with constant leaking and incredible blowouts! And I even bought the good kind! First off they do not last the whole night, I actually had enough sense to bring diaper covers to put over the disposables for the night...it worked like magic! Second, a good cloth diaper cover rarely allows a blow out to occur. -a highchair, I wish I had brought more than one, we strapped it onto the bench at the campsite and the babies really enjoyed sitting in it and watching all the action (grown ups cooking). 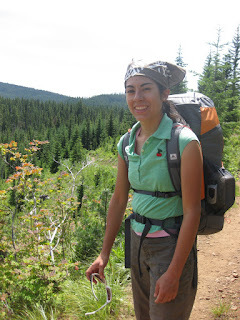 -backpack hikers, I borrowed two and the babies really enjoyed being up high and they seemed really comfortable. -plenty of clothes, I way under packed and Thomas ended up in a diaper and shirt for the big hike (incredible blowout). I can't believe it, we've been married 7 years and together for almost 10! Without sounding too cheesy or getting too mushy, here is our love story. I grew up in San Jose CA (just South of S.F.) 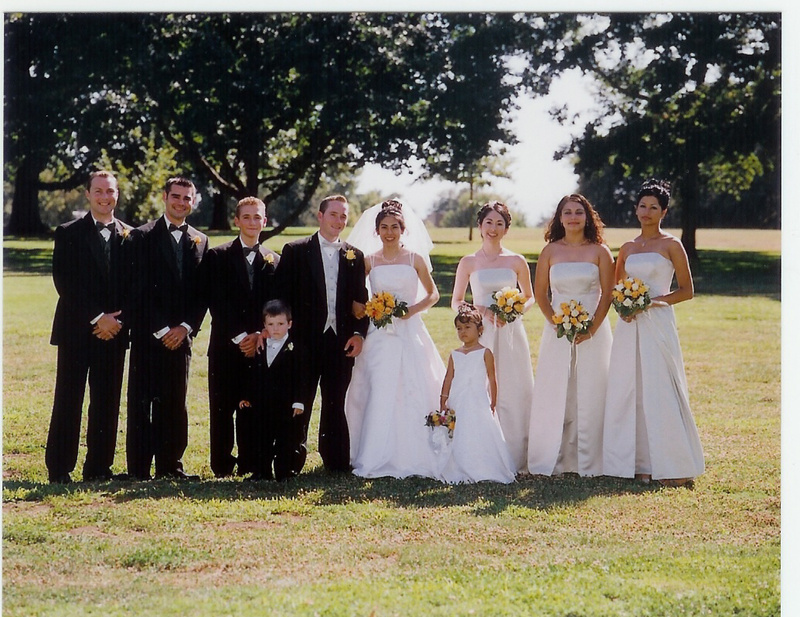 and in 2000 I graduated high school with decent enough grades to get accepted into the University of California at Davis (just outside of Sacramento). Phil was born in Wyoming but pretty much grew up in Davis CA, a cute little university town that I would still love to live in if it wasn't so expensive and if it didn't get sooo hot in the summer. Phil and I attended the same congregation but it wasn't until my second year of college that we really got to know each other. We were not set up but since we had a mutual friend we started hanging out often. Shortly thereafter we were inseparable and we saw each other almost every single day, we dated for a year and a half before getting engaged. Phil at the time was in junior college and put off applying and transfering to UC Berkeley by a whole semester so that we wouldn't have to be apart for so long. How could we survive being a whole 1hr away from each other for a whole 5ish months!!! We were engaged for a year which allowed us to to plan our wedding, finish up college, Phil applied and was accepted to UCB. In the summer of 2004 I graduated from UC Davis with a B.S. in Microbiology, a major I totally loved and am fascinated with. 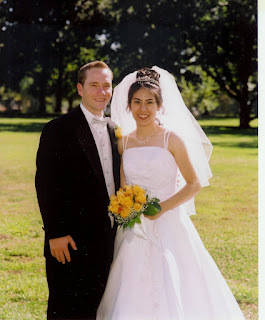 We got married just a month later, I was 22 and Phil was just three weeks from turning 22. I went from Janet Jimenez to Pittsenbarger. We had a cute wedding with about 125 guests and then we spent two weeks honeymooning in Vancouver and Victoria, British Columbia. When we got back we officially moved into a cute tiny little 400sq ft apartment in Berkeley CA, which we paid a whopping $900/mo! Since Phil would be going to school full time I had to find a job to support us and fast! I applied to over 100 jobs that I was somewhat qualified for in 3 short months, I only got about 4 interviews. I was so relieved and excited when I was offered the PERFECT job that paid more than I had hoped for and was only a short 15min commute from our apartment. I would be working in a lab at Children's Hospital of Oakland researching a bacteria that causes meningitis, Neisseria Meningitidis (OMG I still remember how to spell it!). 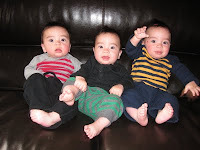 It is an awful disease that I'm getting my boys vaccinated for as soon as they are old enough! Phil got straight A's and was able to get lot's of grants and scholarships which paid for most of his schooling and a couple of vacations for us too : ) He graduated in 2006 with a B.A. in Architecture. We had a blast and loved the two years we lived in Berkeley but it never felt like home to us and we wanted to move on to something different. Everywhere we wanted to live in California was too expensive and everywhere we could afford we didn't like. So we thought we'd check out Portland, OR. 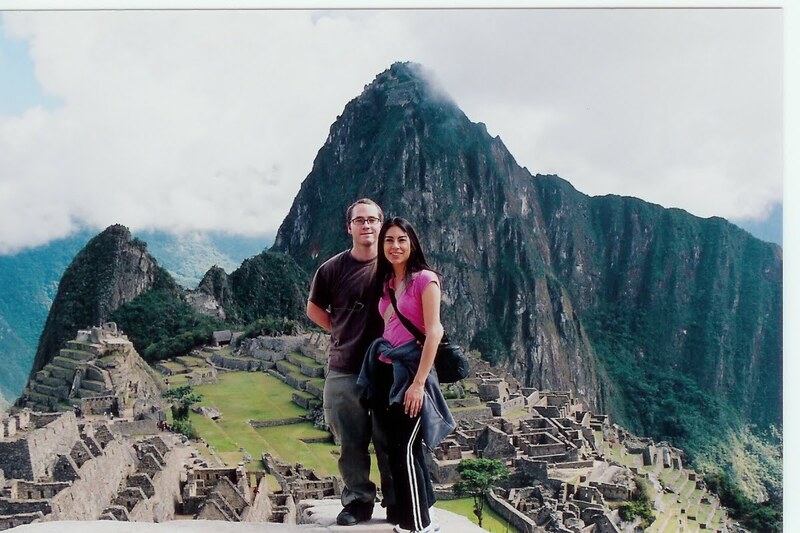 Shortly before moving to PDX we visited Peru. Machu Picchu is one of the awesome-est places ever! We were amazed, Portland had everything we wanted and was so affordable. We were sold. Phil applied to several firms and most called him back for interviews. He got several job offers and he took the best one. With experience under my belt I quickly found another job as well working at OHSU in a prostate cancer research lab. We said good bye to over priced housing, commuting, road rage, and 8+% sales tax. The only thing we miss is family and the sun. Phil and I embraced the Portland life style. We hiked, back-packed, fished, went to countless happy hours, took light rail to work in the winter and commuted by bike in the summer. The plan was to eventually have kids and most likely 2 max. I didn't want to start until I was 30 but also wanted them to be at least 4 years apart. The four year plan sounded better so we started a little earlier than we wanted. 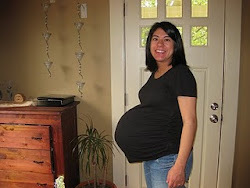 I got pregnant at 28 and you pretty much know the rest! We've had to make major lifestyle changes but we couldn't be happier to be blessed with a wonderful marriage and three great boys! 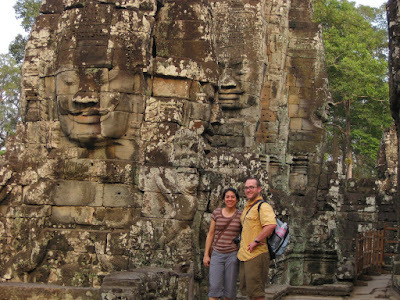 A trip to Cambodia and Thailand was our last hooray before kids. 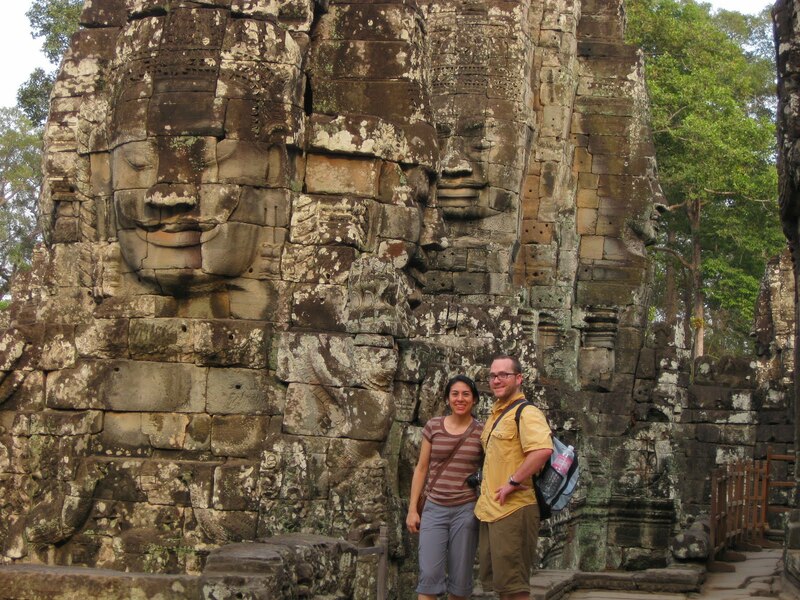 In Cambodia visiting the temples.